A more accurate title to this post for me would be to switch Valentines with Galentines (where are all the other single ladies at? ), but that doesn't mean I don't get to celebrate the holiday! If you've been following my blog for the last few years you'll know that my parents always made Valentines Day special for my sister and I one way or another. Whether it was sending care packages to us in college or just a little box of chocolates, I never felt that it was something that I was to be left out of just because I was single. Even though my parents are gone, I'm still going to celebrate just the way they taught me to. This holiday isn't just for couples, but for friends and family too. It's a day to celebrate love, so why not celebrate with ALL the people you love? This year I'll most likely be having brunch with a few of my closest friends and I wanted to share this sweet lace dress I picked up just for the occasion. The best part is that it's under $30! I honestly wish I had more opportunities to wear this dress out because I just love it so much. There's just the right amount of lace here that it isn't overwhelming, but not so little that it doesn't make a statement. I grabbed it at Target, and I've got to say I've been obsessed with the new fashion lines that they've added recently!! Seriously, if you haven't been to your local target lately, I highly recommend checking it out. 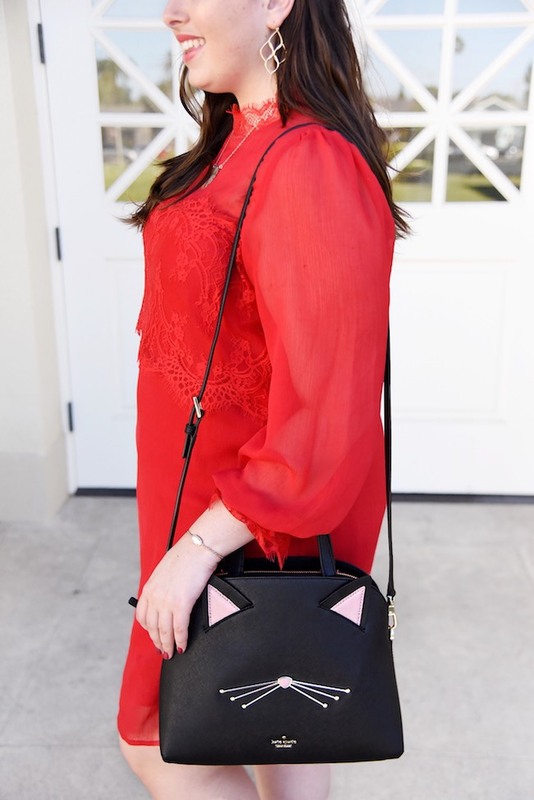 I also want to mention this ADORABLE kate spade cat bag! My friends all pitched in and bought it for me for my birthday and I. Am. In. Love. If y'all know me at all, you know I have a huge love of cats and even have my own little fluff ball Henry so the Kate Spade cat line has been something on my mind for a while. I've always been a loyal Kate Spade fan, but since her bags are a little pricey, they aren't something I can usually afford. The second I saw this bag I knew it was something I would want to save up for, I mean hello! It's a black cat bag for the girl who LOVES black cats! But unfortunately it kept getting sold out! I'm so thankful for my friends for such a generous gift. Besides the fact that I'm a crazy cat lady obsessed with this bag, it also just makes for an awesome everyday purse. It's the perfect size and has three separate pockets that makes organizing a breeze! Maybe I got a little carried away with the cat purse description...but the point is Valentines Day is meant to be a day where you can express the love and gratitude you have for others. Get dressed, grab brunch or a romantic dinner and spend the day with the ones you love! I love the lace detail on your dress! And I'm totally with you on the idea that Valentine's day is all about celebrating all the people you love! I have a long tradition of sending handmade valentines to all my sisters and my brother--I love thinking up personal messages for them each year and making sure to write encouraging notes according to whatever is going on in their lives. Lace is my favorite! I love red for Valentine's Day! 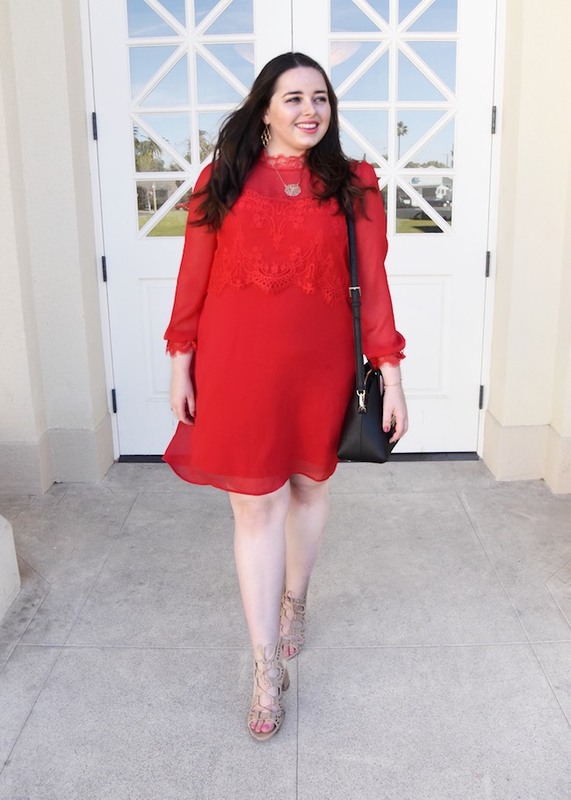 Two of my blog friends have this dress and have also styled it for VDay. I clearly need to get my hands on this dress. That dress looks amazing on you. I love the elegant lace detailing. Beautiful. You look amazing! So ready for Valentines in this cute dress! Your dress is so pretty! I love the lace detail. And I agree that Valentine's day is all about showing appreciation for those that you love. I love the lace detail in this dress. It's so feminine and beautiful. It looks great! I am loving this dress! The lace detail is just too gorgeous! Love the dress and the bag. Happy Galentines Day when it comes! 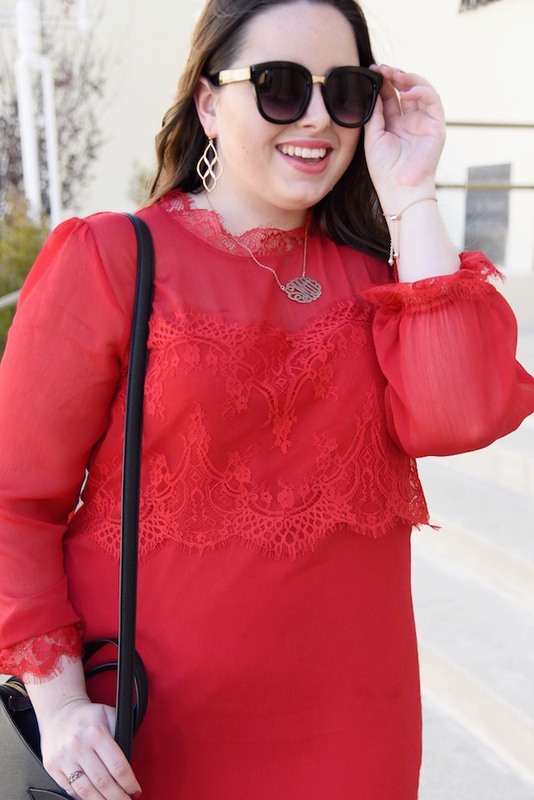 Such a classic look and perfect for Valentine's Day! That lace detail is beautiful. This dress is so pretty on you! I love the color and all of that lace detailing, gorgeous! That truly is the perfect valentines day dress!! It is SO beautiful!! 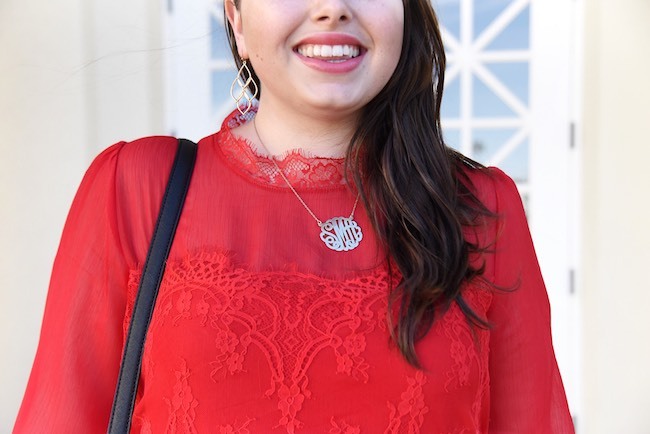 I love the bright red, the sleeves and the lace detail. I tried this dress on at Target recently and loved it! SO cute. Ahhhh that is such a gorgeous dress and such a lovely color on you! I love the lace detailing on it in the middle. And your bag is seriously sooo cute! This look is so cute! I really love the dress - you look great in red! This dress is so gorgeous girl!!! I am loving the lace detail! 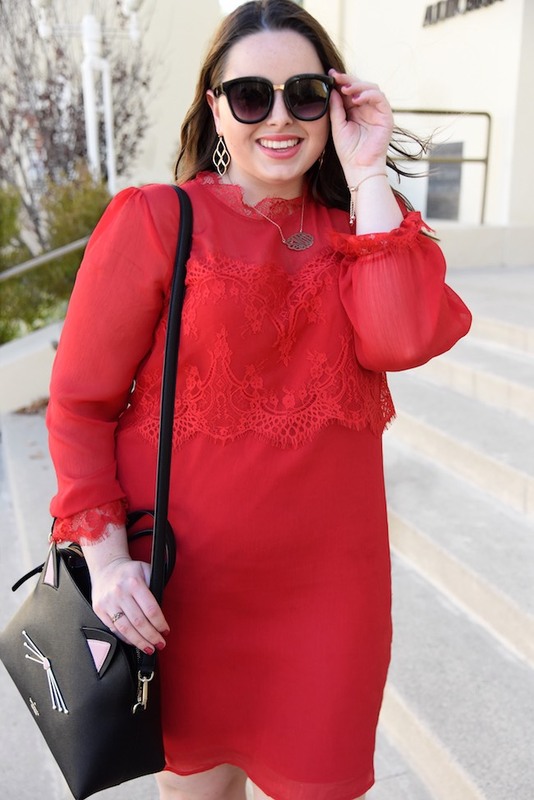 This dress is beautiful and PERFECT for Valentines - I mean, Galentine's - Day! That dress is too cute! What I am loving most is that bag tho! Adorable! I am loving this color on you! That bag is too cute too! Aww that dress is perfect for Valentine's day! I love the delicate lace details! Also, that bag is absolutely adorable! 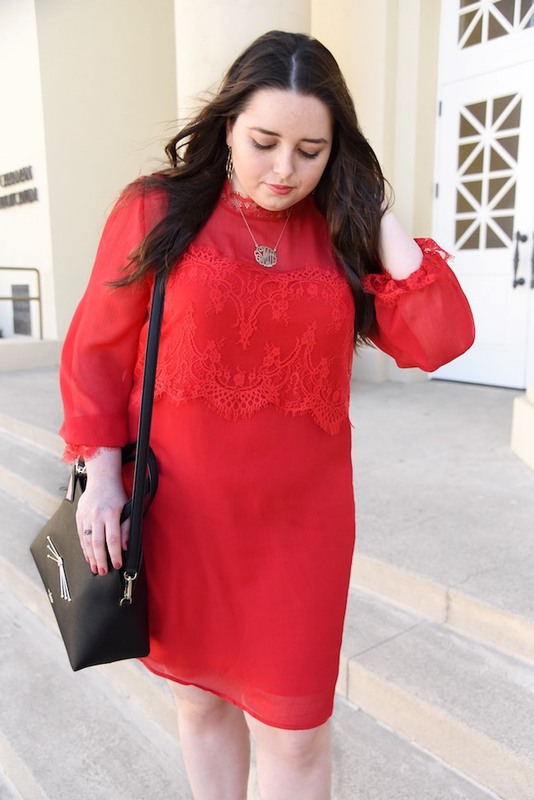 This bright red is so classic and the lace is so elegant! Wait wait wait, hold up! I need that purse! Like it's for real the cutest ever haha. I'm such a cat obsessor omg. Loving this whole look, lady. Too pretty! Red is stunning on you! Love this dress! I love this dress! We are staying casual for Valentine's Day - going to see Fifty Shades of Gray so no need to wear a dress! I love the lace detail on this dress! It's such a cute pick for Galentines Day! You look so gorgeous in red and I love your necklace so much!! Obsessed with those shoes! Gorgeous! OMG that purse was on my Christmas list and I didn't get it! I'm so jealous! Pretty dress! I love your outfit, especially that cute purse!